One hundred yards long and 53 yards and two-thirds inches wide, the field’s grass the night before the game was given a $3,000 green spray job. It was well worth the price. 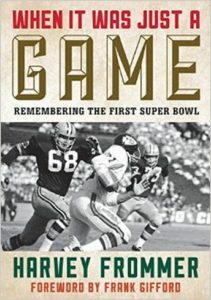 For this most novel of football games, celebrities in the privileged seats included: famed movie and TV stars Henry Fonda, Kirk Douglas, June Allyson, Janet Leigh, Chuck Connors, Danny Thomas, CBS TV anchor Walter Cronkite, comedian, and serious sports fan Bob Hope, late-night TV host Johnny Carson. Ten astronauts were among the VIP guests invited to the game. Five were given seating behind the Green Bay bench. The other five had seats in the back of the Kansas City bench. On this bright and clear day, a carnival-like atmosphere was on parade outside the venerable edifice. Lots of hawkers sold to a crowd that in the main was pretty well dressed for the occasion. Many men wore suits with ties or came in sports jackets and slacks. Lots of women were bedecked in their Sunday best. All manner of hats were worn. There were even Kansas City zealots who sported caps and hats with feathers stuck in them – an acknowledgment of the team nickname -Chiefs. TV Guide that week carried just a listing of the game to be played. There was no cover coverage. There was no big article. Television pre-game festivities were simple. CBS showcased the Harlem Globetrotters playing basketball on an aircraft carrier. NBC carried a football year-in-review show that was broadcast over Armed Forces TV in Vietnam at one in the morning. Beer, snacks, and rifles were at the ready as troops settled in to enjoy the game. SHARON HUNT: There was a sense that we were part of something new and history-making. We were seated just about halfway up probably on about the 30 or 40 yards, not real high or low in the stadium. It was a simpler time. The name Super Bowl was freely used. It was something that a toy a child was playing with could have inspired the name. But the “AFL-NFL Championship Game” was just too cumbersome. The multi-syllabled official title was a mouthful. It was too long for newspaper headlines. “Super Bowl” was catchy, clever concise. Those first two years, everything that was printed — the tickets, the programs – featured the words AFL-NFL World Championship Game. By the third year “Super Bowl” would be the final and official name. Less than a month before at the Coliseum a regular-season game between the Green Bay Packers and Los Angeles Rams attracted 72,418 fans. Initially, the omnipresent and enthusiastic Pete Rozelle was convinced that for this championship game of championship games there would be a 93,000-seat sellout. Later his office downsized the estimate to 70,000. The day of the game the official attendance was announced as 61,946, lots of empty seats. It was reported that the NFL commissioner was taken aback when a stadium that drew 102,368 for a Ram-San Francisco 49er regular-season game in 1957 and in excess of 92,000 for three 1959 World Series games was only two-thirds full in a stadium that seated around 93,000 for football. MICKEY HERSKOWITZ: The game drew over 60,000 but was considered a real box office bust. But even in today’s new stadiums 63,000 is considered respectable. We had only about a month of marketing to attract that. LEN DAWSON: They thought all they had to do was open up the Coliseum and people would come rushing in. CHUCK LANE: That day to start there was almost like a maritime level atmosphere that was almost kind of misty. And then the sun came out and it turned out to be a beautiful day. The Coliseum is a large, cavernous, historical building and there was a considerable contingent from Green Bay present. We traveled well; that’s kind of been a historical fact for the Packers. FORREST GREGG: The Coliseum, never gave it a thought. We could have played the game on the moon. It would have not made any difference. FRANK GIFFORD: I had played my college football in the Coliseum so I was not awed by it. It was then and still is a pretty awesome place. 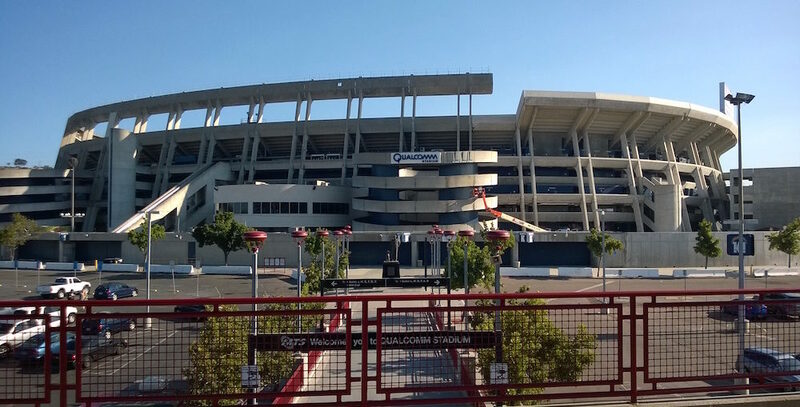 BOYD DOWLER: We played in the Coliseum every year because we played the Rams out there every year, so it wasn’t like our first visit to the Coliseum. Oh yeah, it was a special game. And we’d never seen those guys, we’d never lined up against those guys. The only thing was we had won the championship the year before, so we played against some of their young guys in the College All-Star Game. But that was different. BILL CURRY: We arrive at the Coliseum. We get to the locker room, again, business as usual. Somebody had to get tape, another guy had to go meet with the trainer “for special reasons,” meaning there was going to be an injection. I had my ankle injected because that’s what you did in the NFL. I had injured it in the game against Dallas two weeks prior. CHRIS BURFORD: Compared to most of the places we’d played in like the old War Memorial in Buffalo, the Coliseum was okay. I remember playing back in the day in Buffalo when we used to have to go to this little tiny locker room up these metal stairs that was right off the concourse if you could call it that, where the hot dog stands were. And you’d have to dress in a little locker with a little tiny cage about one feet by three feet, put your stuff in it, walk down the stairs, go through the crowd by the hot dog stands, walk down through the stadium on, I guess, the third base side of the old baseball park there, and then go out on the field. But we could have played in a schoolyard. It did not matter to me. The Coliseum was a nice place to play because they had nice locker rooms. The Coliseum was quite a bit different then. The Coliseum wasn’t that old then. It wasn’t any bigger as far as seating capacity than Stanford’s stadium when I played there, about 90,000 also. CURTIS MCCLINTOCK: For the American Football League, for our team and for all who supported us, that game was the first flight to the moon, momentous. That Coliseum stadium and any stadium for a player, it was how good is the grass and how good is the field. It was all about a bench that was not too close to the stands but close enough to the field so that we could observe it and not be close to fans and all the loud noise. That was the Coliseum to us. The Green Bay Packers received the press box side, the shady side of the field. The Kansas City Chiefs, not too happy with it, were assigned the sunny side, the non-press box side. JERRY KRAMER: Stepping onto the field at the Coliseum, the place seemed half empty. The game was of less importance. I don`t think the public was ready for it. Our feeling was we`d beaten Dallas in the NFL championship on a last-second touchdown and that was our season. There were many more in attendance for the Dallas game. That was the big one. The Super Bowl was just another game. BOYD DOWLER: There had been no preseason games between the leagues. This was the first exposure. We went down for pregame warm-ups and were looking at the Kansas City Chiefs. What he proceeded to tell me was about the events of the night before, and the fact that he hadn’t gotten too much sleep. He said he had missed curfew and had gotten in early in the morning. He said Bart saw him come in because Bart was always down real early in the morning. I never had a thought of what was to happen later. “Are you okay?” I asked Max. In the tunnel, Kansas City receiver Chris Burford told Jerry Mays to get a look at Buck Buchanan, all six foot seven and 290 pounds of him. The Kansas City defensive tackle’s face was streaked with tears. “Waiting in the tunnel to be introduced, guys were throwing up and wetting their pants,” said Kansas City linebacker, E.J. Holub. To me that was the gentlemanly thing to do. They were so tight they wouldn’t even talk! I didn’t know what was going on until I found out later all this stuff about the owners and everybody being just petrified that we just might have a chance to beat them. BART STARR: There were a lot of loud Packer fans there. I know they were very proud to be fans and be there for that team, and so we were extremely proud to see and hear that too. You’d be surprised at how many fans from an area back up in the Upper Midwest in a small community were at that ballgame. And then I’m sure there were a lot of Packer fans from other parts of the country. All things considered, there were two things about the crowd that was surprising. Its smallness was a surprise compared to the high hopes held for it in the NFL office and especially by Commissioner Pete Rozelle. The other surprise was a large number of fans at the Coliseum who contrary to what was expected seemed to be geared up to root for the underdog Chiefs. BART STARR: There was very deep, embedded excitement coming out with my teammates onto the field. We were very, very anxious to begin. It wasn’t just another game. More importantly, nothing like it had ever been done before. There was a sense for some of us that we were part of a historical event. LEN DAWSON: I felt special incentive to perform in that first Super Bowl. A cast-off from the NFL, I had almost become a Packer because they needed a quarterback while I was with the Browns. Paul Brown was thinking about sending me there, but he turned around and sent another quarterback who would do some punting as well. But for me to go against the Packers and all the top players who were there, that was my vintage, out of my time, a lot of the players I played against in college. That was something to get up for. All kinds of unique features attracted themselves to the culture of that first game. The pitting of representatives from two leagues for the first time who had never played against each other for the world championship was ground-breaking. The disappointment in the empty seats at the Coliseum, the smallest crowd to ever attend a Super Bowl, the only Super Bowl that failed to sell out, was of note. The “newness,” of it all made for a lack of tradition for the event. The playing of a championship on a neutral site lacked a history. A neutral site made many fans neutral to the game. DOUG KELLY: Two Midwestern teams and LA is very into itself in terms of what they deem to be cool. The first time around, it wasn’t cool! It was two relatively unknown teams playing in a huge facility, the Coliseum, and I think people looked at it somewhat askance. The American Football League wanted its officials to wear the uniforms they wore in their league games. Very colorful with red-orange stripes, black collars on shirts and black cuffs, the logo of the AFL prominent on the front of their shirts, caps, sleeves, the whole package was pretty easy to see. However, the sometimes surly and always assertive Mark Duncan, head of NFL officials, was downright dismissive. His opinion was that AFL uniforms made the wearers resemble candy stripers in a hospital. A compromise was reached. Wilson Sporting Goods designed “neutral” uniforms for the game. They had the familiar NFL look of black and white stripes, sleeves all black with the official’s uniform number. Hats were white with a black bill. That uniform would last until Super Bowl III when uniforms sported by officials were NFL standard fare. Another minor controversy was centered on which league’s football would be used in the game. A compromise settled that. Green Bay would use the NFL Wilson “Duke” ball. Kansas City would stay with its AFL sanctioned Spalding J5-V. Little difference in the footballs existed aside from the AFL ball being a little more pointed than the NFL ball. A quarter of an inch longer and thinner than the Wilson model, some said the AFL ball was a bit easier to throw. On offense, the football would be changed by the game referee Norm Schachter, the NFL’s top official. Sometimes the wrong ball would wind up in the hands of an irritated center or player who complained and insisted on having the “correct” football. HANK STRAM: Our defensive captains Jerry Mays and John Gilliam met the Green Bay captains Bob Skoronski and Willie Davis in the center of the field to reenact the coin toss which had been made earlier in the dressing room. Three officials from the NFL and three from the AFL would see duty that January Day. There were six alternates as backups. That 1967 crew of a dozen officials – six officials and six alternates is still a Super Bowl record. The Brooklyn-born Schacter began refereeing local football games in 1941 in California. He was a Marine Captain in WWII. In 1954, he began working for the NFL as an official. He was paid a hundred dollars a game. Seven games were guaranteed. Norm Schachter tossed the coin. Willie Davis, captain of the Packers, called “Heads!” Green Bay always made its call “Heads.” Coach Vince Lombardi believed that the eagle side of the silver dollar weighed more. Heads it was. Tex Schramm, general manager of the Dallas Cowboys, came up with the idea of utilizing a remote control system for the L.A. Coliseum scoreboard clock for the first Super Bowl. That system had been successfully tested out by his Cowboys during the just-concluded football season. A primitive remote was attached to the huge wrought-iron hands of the Coliseum clock. During the week before the game, test after test was conducted. The remote and the clock worked to perfection. The time for the opening kickoff arrived. An official on the field of play activated the system. Then incredibly, one of the giant hands on the clock disengaged. Like a scene out of a horror movie, it fell more than fifty feet like a gigantic dagger into the stands below. It could have been a tragedy. Miraculously, however, that section of the Coliseum was empty. No one was hurt. “The goddamn clock’s” ancient hand given such a testing and re-testing workout, had just worn out and fallen off. “Super Bowl, reel one.” It was a name that was catchy, seemed official and historical. Much of the piece is excerpted from Harvey Frommer’s acclaimed When It Wass Just a Game. If you enjoyed this piece, the book is available on Amazon and from the author. One of the most prolific and respected sports journalists and oral historians in the United States, author of the autobiographies of legends Nolan Ryan, Tony Dorsett, and Red Holzman, Dr. Harvey Frommer is an expert on all major sports. Cited by the Congressional Record and by the New York State Legislature as a sports journalist and historian, a professor now for more than two decades in the MALS program at Dartmouth College, Frommer was dubbed “Dartmouth’s Mr. Baseball” by their alumni magazine. 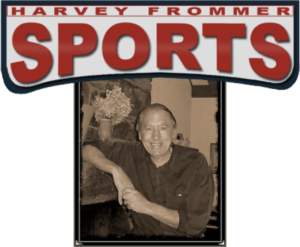 He’s the founder of www.HarveyFrommerSports.com.